192.168.1.100 is another private IP address from the block C but this one is not used as a default gateway like many others we’ve talked about in our previous articles. This one is not preferred by router manufacturers and they don’t assign it to their devices. 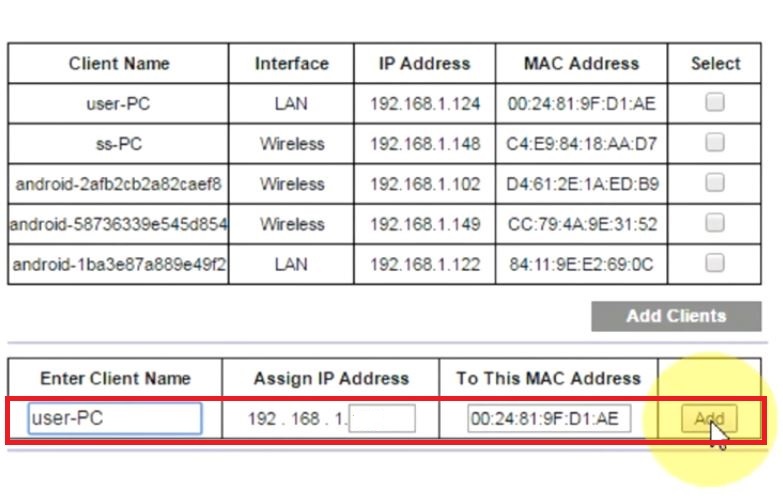 On the other hand, router manufacturers often use this address as a starting IP in DHCP pool (on 192.168.1.1 routers – Linksys and Cisco, for example) just like they use 192.168.0.100 as a starting IP on 192.168.0.1 routers. As we’ve said, 192.168.1.1 routers often have 192.168.1.100 set as a starting IP address by default. The manufacturers prefer ‘’round’’ numbers because it’s easier to remember the DHCP range that way (that’s the only reason we can think of). This is not a rule and you can redefine the range at any time. Look at the Cisco router example below. 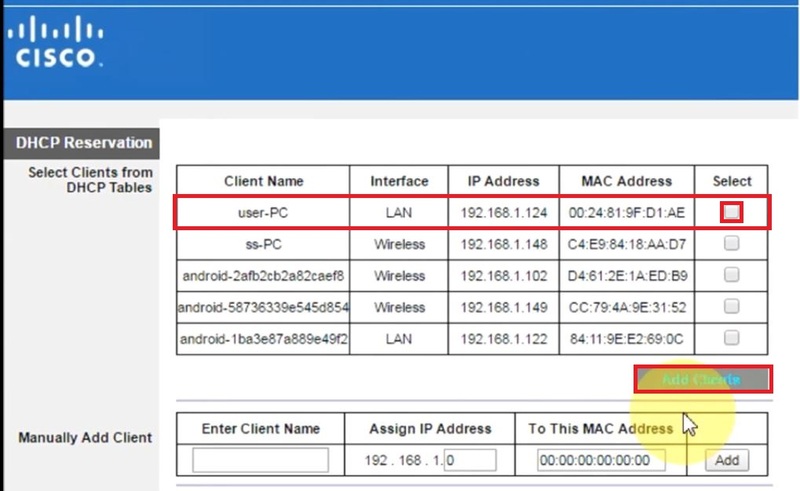 As you can see, you can choose the starting IP address (change the last number in starting IP address) and you can expand or shrink the scope of available addresses by entering the ‘’Maximum Number of Users’’. So, this default starting address and range are not written in stone. If you leave the defaults, 192.168.1.100 will be assigned to the first device that connects to the network. The process of assigning 192.168.1.100 as a static IP to some device (printer, PC, phone) is really simple. We are going to explain it in details on a Cisco router but the process is the same with any router. Step 1 – Open your browser, type in your default gateway (in our case 192.168.1.1) and press Enter. Step 2 – In the Login Window, type in the correct username and password (these are username and password for your router not for network). Defaults for Cisco modems are usually admin-admin. Step 3 – Basic Setup page will open. 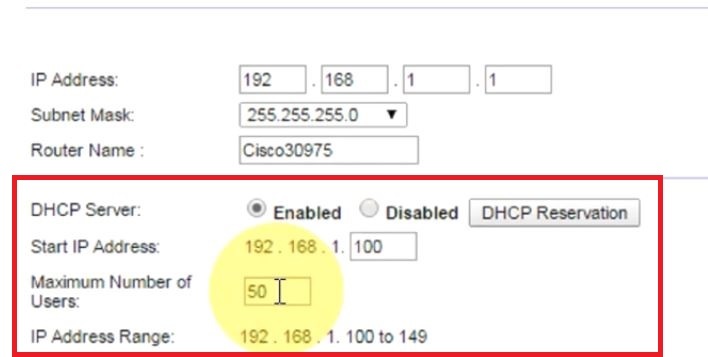 Scroll down to the DHCP Server Settings. On some other routers, you may have to click on Setup Tab and choose Network Setup from the submenu. In DHCP Server Settings, click on DHCP Reservation. 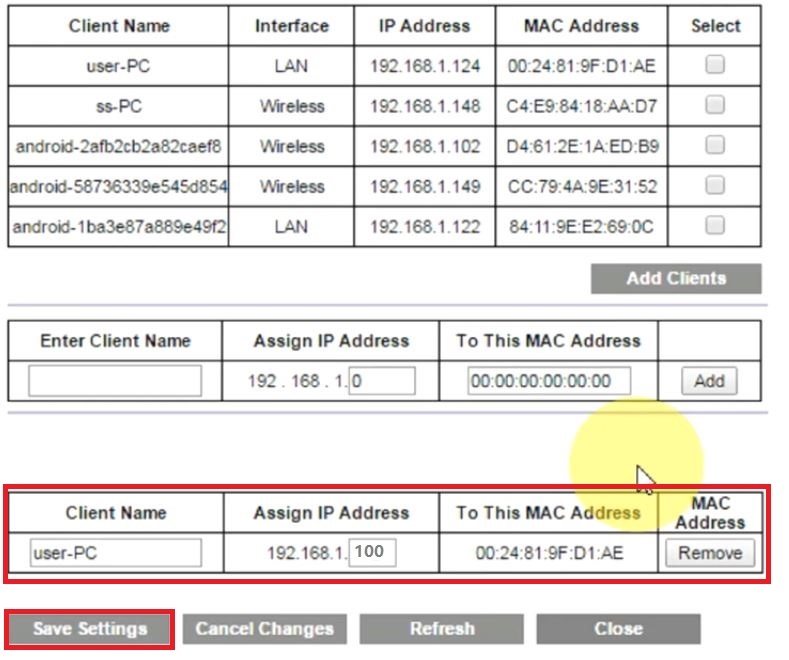 Step 4 – DHCP Reservation window will open and you will see the list of connected devices with their names (Client Name), Interfaces (LAN or Wireless), current IP addresses, and MAC addresses. Or you can choose to assign the address manually to a client by entering all the necessary data (Client Name, Interface, Desired IP address (you have to enter the last number of the IP address), and MAC Address) and clicking on Add. Step 5 – After you click on Add, a new table called ‘’Already Reserved’’ will appear and you will find there a list of clients with reserved IP addresses (in our case, there is only one client). In order to make a reservation, click on Save Settings. New IP address (in our case – 192.168.1.100) won’t be assigned to your device immediately. You will have to restart your device or to disconnect and then reconnect to the network (disable and re-enable your LAN) in order for the changes to take effect.